Deontay Wilder’s manager Shelly Finkel revealed to the boxing press at the Wilder vs Ortiz post fight press conference that he’s not heard back from promoter Eddie Hearn who represents Anthony Joshua since last November when it comes to further discussions about a potential Joshua vs Wilder fight. Finkel also revealed that no negotiations have ever taken place between the two parties and strongly feels that Joshua and his team are dodging the fight for at least the immediate future. Eddie Hearn has since responded to these claims, and expressed that the reason he stop discussions with Wilder’s team is because of Wilder’s public demand for a 50/50 split and also says that Wilder’s team have never made an attempt or contacted him for a potential Joshua fight. No matter who’s at fault for the delay of the Joshua vs. Wilder fight, most sane boxing fans don’t care about the back and forth disagreements between fighters handlers. They only want to see the fight at a reasonable time frame when both fighters are still arguably at their peak of their careers. And that is where the focus should be going forward for the teams of both fighters in figuring out the best time to put this fight together. Promoter Eddie Hearn has expressed in numerous interviews that the end of 2018 could be the natural fit for this fight to occur and he may be right. Joshua (20-0, 20 KOs) has never fought in America and if he defeats Joseph Parker later this month to unify three of the four heavyweight straps, there are plans already in place for Joshua to perhaps makes his U.S. debut at the Barclay’s Center in Brooklyn possibly against Jarrell “Big Baby” Miller (20-0-1, 18 KOs). However, the issue with this potential bout is that it sounds a lot like a HBO fight, which could mean Joshua is potentially going to change U.S. broadcasters in the near future. Joshua switching from Showtime to HBO could further complicate matters in getting a deal done, but the most likely destination of a potential Joshua vs Wilder fight would be in Las Vegas. So it would make sense for Joshua to test out the American market and see what numbers he produces in America prior to a fight with Wilder. The reality is the boxing world wants to see this fight and Deontay Wilder (40-0, 39 KOs) did his part in building this fight by taking on the one of the most dangerous contenders in the heavyweight division and defeating Luis “King Kong” Ortiz (28-1, 24 KOs) by 10th rd stoppage in Brooklyn this past Saturday night. 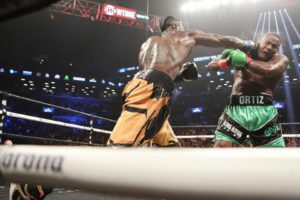 Wilder didn’t’ show great boxing skills, was quite vulnerable throughout the contest, but showed heart, great recovery powers, athleticism, and the ability to close the show when he has his opponent hurt. Wilder is a threat in the heavyweight division not because of his limited boxing skills, but because of his desire to prove he is the best, his will to win, god gifted athleticism, and one punch knockout power in his right hand. Joshua vs Wilder is finally ripe and ready and it should take place by at least the end of this year, while both are still arguably at the peak of their careers.